Welcome to the RCHA Club! 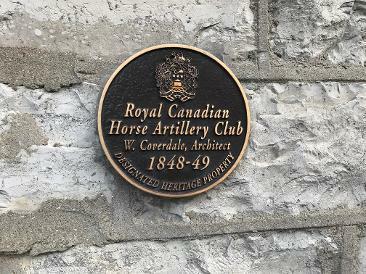 Welcome to The Royal Canadian Horse Artillery Brigade Association (RCHA). We are your first stop to experience Kingston’s great live music scene! Home venue for the Kingston Blues Society (insert their link? ), participating venue for the Homegrown and Limestone City Blues Festivals (Downtown Kingston link), the RCHA offers a wide variety of live music, featuring talented musicians from Kingston and beyond. Check our Events Calendar for upcoming acts you will not want to miss! The RCHA Club is a downtown Kingston landmark since 1947, is open to all, but is supported by memberships welcomed from anyone interested in supporting the Association, including active or retired military personnel. Check our Membership Benefits link for further information. Our club rooms are also available to rent for your event; contact us for availability and rates. We are located at 193 Ontario Street, adjacent to the Tourist Bureau. Look for the blue awning outside our heritage building and take the elevator to the third floor. 20% off most ticketed events at the club, exempt from cover charges, reduced room rental rates and discounts at several local businesses. For more information on how you can become a member, please click here.